Pollard, T.D., Blanchoin, L., Mullins, R.D. (2000) Annu. Rev. Biophys. Biomol. Struct. 29: 545-576. Carlier, M.-F., Pantaloni, D. (2007) J. Biol. Chem. 282: 23005-23009. Watanabe, N. (2010) Proc. Jpn. Acad., Ser. B 86: 62-83. 文献1) Ishikawa H, Bischoff R, Holtzer H. J Cell Biol. 1968 Sep；38(3):538-55. 文献2) Kim S, Wong P, Coulombe PA. Nature. 2006 May 18；441(7091):362-5. 文献3) Sugimoto M, Inoko A, et al. J Cell Biol. 2008 Oct 6；183(1):19-28. 文献4) Inoko A, Matsuyama M, et al. J Cell Biol. 2012 Apr 30；197(3):391-405. 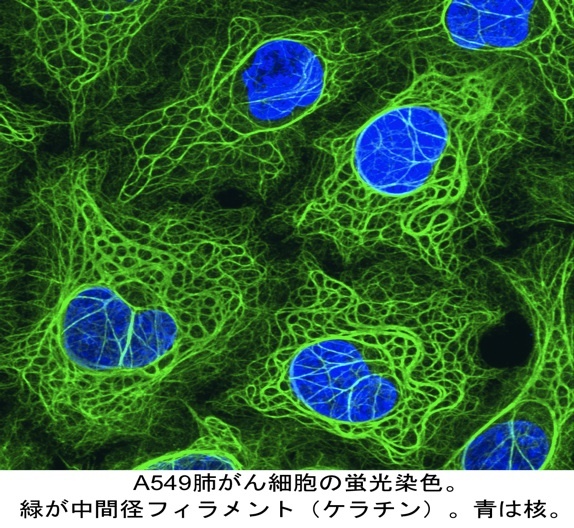 文献4') "In Focus: Trichoplein keeps primary cilia silent" J Cell Biol. 2012 Apr 30；197(3):341. 総説1) Fuchs E, Cleveland DW. Science. 1998 Jan 23；279(5350):514-9. 総説2) Coulombe PA, Wong P.　Nat Cell Biol. 2004 Aug；6(8):699-706. 総説3) Izawa I, Inagaki M. Cancer Sci. 2006 Mar；97(3):167-74. 文献1) Inada H, Izawa I, Nishizawa M, Fujita E, Kiyono T, Takahashi T, Momoi T, Inagaki M. J Cell Biol. 2001 Oct 29；155(3):415-26.